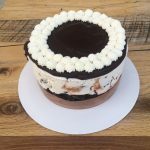 Create your own ice cream cake with a variety of flavors and add-ins, in the same 3 sizes as our signature cakes. Chose an ice cream flavor for the base of your cake. Choose another ice cream flavor to go on top. If you forget to pick one, we’ll use whatever you chose for the bottom layer. Choose your first add-in. We’ll use our ice cream wisdom to determine which add-ins should go on top vs. in the middle. Would you like whipped cream on top? Choose a second add-in, if you like. 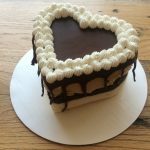 If our signature cake varieties don’t strike your fancy, you can create your own! Choose up to 2 ice cream flavors and up to 2 add-ins. Please note: if you choose “other” for one or more flavors, you should use the notes field at Checkout to tell us your choices. Check the Flavors page for the current selection. Because of changing production schedules, we may not be able to provide your first choice, so please specify at least one alternative. 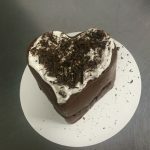 If we cannot make your cake as ordered by the pickup day you request, we’ll contact you by phone or email.